“Cannot rename ‘<new folder name>’. The Folder is Full”. I get this even with folders that have nothing in them. How can I get Outlook back to work again? This means your pst-file or ost-file either has reached its maximum size or holds a corruption. An easy fix could be to empty your Deleted Items folder and try again. If that doesn’t work, the first thing you should do is verifying whether you are working with a pst-file or ost-file in ANSI format or UNICODE format. If you are in ANSI format and the reported file size is around 1.8GB, you have reached the absolute maximum size of the pst-file. In that case, you’ll have to use the pst2gb tool to crop the oversized file to a smaller size so it can be accessed again and you can delete files, archive it or move it to a new pst-file. If you are in UNICODE format and the reported size is around 4GB, you have reached the absolute maximum file size of your disk format (FAT32). Converting your disk format to NTFS is highly recommended. 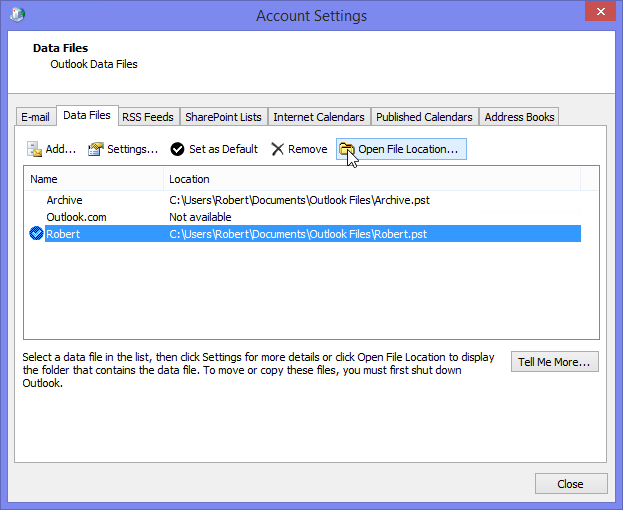 Once you cleaned up the folder, empty the Deleted Items folder and compact your pst-file. After that, check the size again. The emails from your current pst-file would still remain accessible in Outlook. If the above limits do not apply to you and your pst-file is quite a bit smaller, then it is likely that the issue is coming from a file corruption. In that case use the Inbox Repair Tool to scan your pst-file for errors.